Cheese lovers were in for a treat at this year’s International Cheese Awards at Nantwich. The biggest and best cheese show in the world, it celebrates its 120th year with a new set of records. The first record was the number of entries, at 5685 – up an amazing 13.5% from 2016 – from more than 50 countries, including the UK, Europe, the USA, Australia, Canada and New Zealand. More than 250 expert judges and 1,366 dairy professionals took part in the Trade Day Lunch, sponsored this year by Joseph Heler. 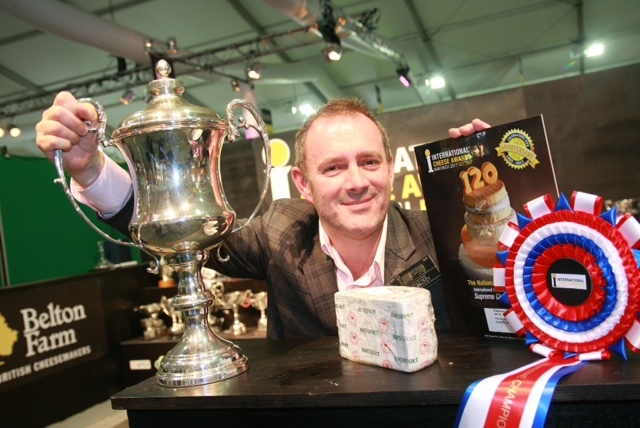 This year’s Supreme Champion and winner of the Westminster Cup for 2017 was then announced as Bradbury’s Cheese for their blue Roquefort Papillon and Reserve Supreme Champion was awarded to Arla Food’s Tuxford and Tebbutt for their blue Stilton. Supreme Retailer for 2017 was presented to the retailer gaining most Gold Awards in the show and once again went to Waitrose, with the Bracknell-based supermarket picking up 24 Gold awards across all classes as well as winning Speciality Cheese Retailer of the year. Morrisons came in second with 18 golds, and also triumphed as Cheddar Cheese Retailer of the year. In the remaining individual retail awards, Tesco was awarded Healthy Cheese Retailer of the year and Marks and Spencer won Cheese Board Retailer of the year. The British Cheese Board industry award was presented to Brenda Davies, recently retired from Arla Foods, and Young Person of the Year went to John Clarke, also of Arla Foods, for his important project on adding vitamin D to milk. For a full list of class results and trophy winners, please visit the International Cheese Awards website.